One of the best RSS services across the web got a boost on Android this week it began offering a beta program. Newsblur, which rose to prominence after the death of Google Reader, has been steadily adding support for iOS and Android on top of its feature-filled web interface, and the backend continues to be one of the fastest around. While the iOS app is coded by the service’s creator, Samuel Clay, the Android version is developed by another team, and has fallen behind in terms of features. To improve user testing and speed up development, Newsblur has started issuing beta versions through Google Play, and the latest version, 3.7, comes with some excellent new features and important bug fixes. Highest on the list is support for Immersive Mode, the KitKat-only ability to hide the top and bottom navigation bars for a fullscreen reading experience. This is especially handy here, and can either be activated by tapping an icon (by default) or, enabled in the settings, with one tap in the article reading view. The app has also been gifted with article previews in the list view, something that was recently added to the iOS and web versions, too. 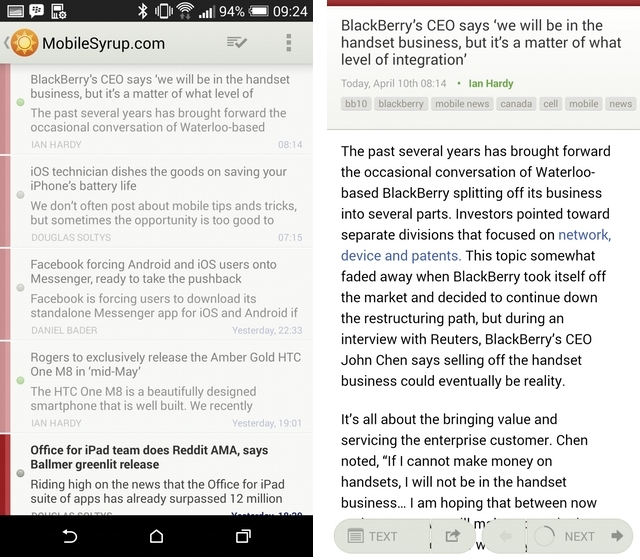 Newsblur 3.7 for Android does away with the annoying time bug, too, and speeds up article loading time even further. It may not be as well-known as Feedly, but Newsblur is quickly becoming one of the most versatile and feature-rich RSS services around. To join the Android beta, join its Google+ community and opt-in to the beta. Once you’ve done that, the app will be updated in the Play Store.